Once the doctor has completed these initial visit procedures, they should present the patient with a verbal report of the findings. From there, the provider is simply executing the treatment plan, during the subsequent visits of the episode of care, laid out based on these initial visit findings. The case management portion of the equation now takes place throughout the subsequent visits of the episode of care. The visit-to-visit evaluation, aka case management, is the process that directs the doctor in ways that the baseline treatment plan may need to be altered. It should never be assumed that once the treatment plan is set, treatment will automatically continue in that fashion. Additional case management is always recommended. Initial evaluation without ongoing case management is dangerous and unwise. “Doctor thinking” must take place on a visit-to-visit basis to determine the need for ongoing care. When documented in the patient’s record, this is proof that the provider is considering the actual patient’s presentation by the visit to verify that the treatment plan is working (or not) and to follow through with next steps. This is no time to “set it and forget it!” Constant and continuing assessment is the name of the game for good case management. KMC University is excited to introduce our brand new Medicare Quick Reference Tool. This invaluable Medicare decision making matrix illustrates how chiropractic works as a Medicare provider. It clearly lays out the twelve critical steps of the patient's journey from initial visit through payment, and includes a go-to page of Medicare terms and acronyms. 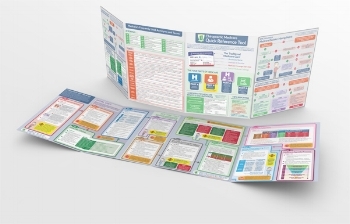 Keeping this highly durable, colorful, printed 8-page resource at your fingertips will assist you time and again as you navigate the choppy waters of Medicare. This tool is well worth its regular price of $99. Reserve yours TODAY and pay just $50. Click here and use coupon code CYBER at checkout.